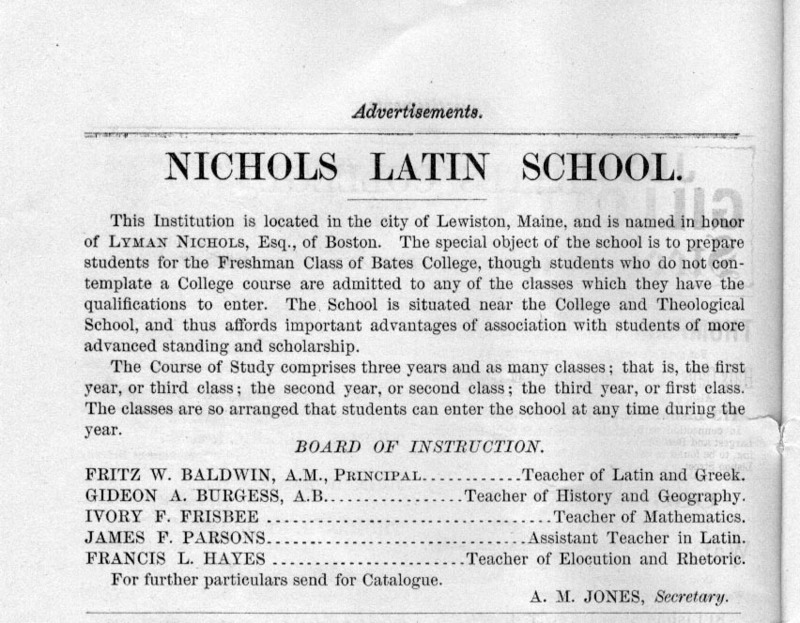 This Institution is located in the city of Lewiston, Maine, and is named in honor of Lyman Nichols, Esq., of Boston. The special object of the school is to prepare students for the Freshman Class of Bates College, though students who do not contemplate a College course are admitted to any of the classes which they have the qualifications to enter. The School is situated near the College and Theological School, and thus affords important advantages of association with students of more advanced standing and scholarship. The Course of Study comprises three years and as many classes; that is, the first year, or third class; the second year, or second class; the third year, or first class. The classes are so arranged that students can enter the school at any time during the year. FRITZ W. BALDWIN, A.M., Principal............Teacher of Latin and Greek. GIDEON A. BURGESS, A.B.................Teacher of History and Geography. IVORY F. FRISBEE..................................Teacher of Mathematics. JAMES F. PARSONS...............................Assistant Teacher in Latin. FRANCIS L. HAYES.......................Teacher of Elocution and Rhetoric. For further particulars send for Catalogue.